Copper in Pool Water… Where Did It Come From? Many people ask this question because as far as they know, their public water supplier keeps a close watch on the levels of metals in drinking water… so then why does copper show up in their pool when they don’t use copper based algaecides? Unless filtered or otherwise purified, most water contains at the very least SOME dissolved minerals and those levels will depend on where the water came from and/or passed through on its way to your pool. As an example, most well water contains dissolved minerals so that means if you fill your pool/spa with well water, your pool/spa water will contain dissolved minerals, too. You can test for dissolved metals in well water with Water Metals Check, an easy-to-use test for metals in water with a low detection level of 10 ppb (parts per billion). Earlier we mentioned that some algaecides contain small amounts of copper in them which serves as an algistat, or algae growth inhibitor. Under the right conditions copper introduced by copper based algaecides will remain suspended (in solution) and you will not know they exist unless you test for them with a copper in water test kit. Metal fixtures (such as ladders) and swimming pool heaters in and around the pool get continuous exposure to sometimes very harsh conditions such as high or low pH and/or extremely high chlorine (or other oxidizer) levels which cause corrosion of the metal surfaces and allow metal ions to enter the water. These ions can create interesting color patterns in water and difficult to remove stains when they fall out of solution and land on the bottom of the pool or other surface. Many times, though, copper discoloration and staining comes from the heat exchanger in a pool heater. As water passes over its multi-tubed, copper finned heat exchanger at a rate faster than the exchanger can handle or in a corrosive form due to high/low pH levels and/or unusually high oxidizer levels, ions of copper come off metal surfaces and enter the water. Another (obvious) problem presents itself when copper heat exchangers start to erode away: Their walls get thinner and thinner and eventually holes develop. Replacing heat exchangers can cost a LOT of money. So therefore, if copper stains and high pool/spa heater repair bills don’t strike your fancy, keep a close watch on the pH, sanitizer levels and from time-to-time copper levels to make sure nothing has started to eat away at your heat exchanger. And finally, some sanitizer systems, such as the Pool Frog Mineral Purifier System, actually USE ionized copper as part of their chemical system as well as ionized copper. Copper ions serve as an algistat and silver ions serve as a bactericide. Manufacturers of mineral-based sanitizer systems strongly suggest testing pool water regularly for critical water parameters such as pH, alkalinity, sanitizer level, etc. so that the minerals do not ‘drop out of solution’ and cause staining. 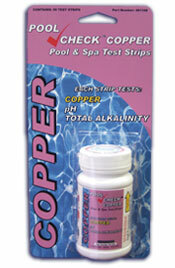 Test strips such as Pool Check Copper 3 in 1 make routine pool testing quick, simple and safe.